The LPGA has placed restrictions on use of stories and photos of its events, prompting an exodus by some news organizations. CONFIDENT of media frenzy over Michelle Wie's season debut as a professional, the LPGA has hit into the deep rough off the first tee of the Fields Open in Hawaii. The organization demanded that media yield proprietary rights to their stories and photos before they set foot on the course. Some news organizations opted out, and the LPGA must wake up quickly or be relegated to the small type on the sports pages. The Star-Bulletin and, most notably, the Associated Press, the world's leading news service, withdrew their reporters and photographers from the Ko Olina Golf Club rather than be subjected to the imperious new rules of the game. The LPGA has long envied the greater attention paid to the men's PGA and chose an inopportune time to stumble. 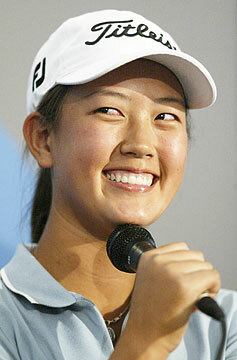 Michelle Wie, then 13, laughed after a practice round for the U.S. Women's Open at Pumpkin Ridge Golf Club in North Plains, Ore.
Frank Bridgewater, the Star-Bulletin's editor, rejected the demand that the LPGA have free use of the newspaper's photos and be able to block any future use of the photos by the Star-Bulletin. "We will not sign a form that places limits on how we can use our own photos or that allow others to have any control over our stories," he said. As an example, AP assistant general counsel Dave Tomlin said the news service would be required to get the LPGA's permission to use a photo of a golfer taken at the Fields Open to go with a story about her involvement in a boating accident or other news event two months after the tournament. No respectable news organization would knowingly agree to such outside censorship. The new rules did not apply to last week's season inaugural, the SBS Open at Turtle Bay, which Wie did not enter. Eighty media credentials, about half from Japan, were issued for that tournament, while 120 reportedly were handed out at Ko Olina before the restrictions were imposed. The gaffe comes eight months after the appointment of former advertising executive Carolyn F. Bivens as LPGA commissioner. Bivens began her 18 years with Gannett Corp. in 1982 by helping launch USA Today, becoming the newspaper's senior vice president and associate publisher, overseeing advertising operations. She was president of Initiative Media North America before heading the LPGA. Bivens assumed the LPGA post as a youth movement led by Wie and Paula Creamer was seen as an opportunity to gain public attention for the women's tour and, with it, more endorsements and higher purses. She told the Star-Bulletin's Paul Arnett last week that she aimed to expand the tour's appeal from the predominantly male audiences of the Golf Channel and ESPN to "a wide audience and different targets." Bivens said she hoped to "turn the buzz and the interest and the conversations into a commercial success." Instead, the LPGA, on her watch, has tried to control media coverage in a hamhanded way that, if continued, is sure to suppress it.